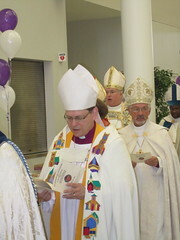 Sermon delivered on Sunday, September 11, 2011 at Church of the Ascension in Buffalo, New York. In the name of God, Creator, Redeemer, and Sustainer. Amen. I am honored to be with you for my second time at Ascension, on this very joyful occasion to institute Mother Cathy Dempsey as your priest in charge, Deacon Pete Cornell and Deacon Kim Greene as you deacons, and other members of the new ministry team, and to celebrate the inauguration of a Covenant agreement between the Church of the Ascension and the Church of the Good Shepherd. And yet here we are today also keeping the tenth anniversary of 9/11. On my first visit here I came to love this church, which is so important because it is a Buffalo city church. I came to know something of its great past, and also became aware of its fragility. I came to know that this proud building, this Christian community might disappear itself into the dust. And so I see today as a celebration of rebirth. Just as Ground Zero now experiences a vibrant architectural transformation into a new future, just as lives went on and were reborn out of the death and tragedy experienced 10 years ago, so is this story of Ascension now one of going from dust to life through the bold hope of this covenant agreement perfectly appropriate for celebration on this day. 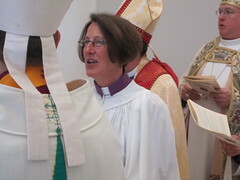 It is also an opportunity for me to pay tribute to the two vestries, to the two congregations, to Canon Barbara Price all who have dared to venture out to make a space for new life. Let me put this sermon about rebirth in the context of my own personal story. As many of you may know, I wrote a book about the response of the Episcopal Church to the terrorist attacks that happened on this very day ten years ago. I was in and out of New York in the hours and weeks following 9/11 and just a few days after the attack I walked down to ground zero with Bishop Paul Moore, the former Bishop of New York. Bishop Moore was a towering figure, a former Marine who had won the Purple Heart in World War II. He announced at every check point, “I am the Bishop of New York, and this is my assistant Bill, and our people are down there.” And with his Marine bearing, the military let us pass through ten check points. 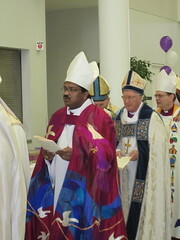 He was not the Bishop of New York, he was then already retired. I was certainly not his assistant, but they let us pass. We arrived at the pile of Ground Zero, which was still burning, and knelt down in the dust by that burning fire. I will never forget that smell and the dust all over me—the which dust certainly which contained the remains of those who had perished. I picked up a piece of wallboard that had been part of the Twin Towers. I have treasured it ever since. Here it is—a relic of that day, and all that it meant to me personally. A few months later the current Bishop of New York, Mark Sisk, asked me to write a book about the way our Episcopal Church responded to 9/11. Because of that experience of kneeling by the burning pile, literally in the dust of humanity, we gave the title “Will the Dust Praise You”to my book. Does that not sum up exactly what we are celebrating today? From dust to hope? Everybody I interviewed about that day talked about the dust—the white pallor of dust, like the pallor of death everywhere. The sharp crunchy particles that blinded the eyes and irritated the nose and throat. The depth of the dust around the feet as one fled across the familiar cityscape. The dust clogging the organ pipes in Trinity Church and St. Paul’s Chapel, so that those organs could never be used again and had to be replaced. Dust was the meaning of the disaster of that day, for the twin towers, the proud embodiment of all that modern civilization had to offer, literally turned to dust. The steel and concrete skeleton, the latest in office machinery and computer technology, and the men and women whose work and dreams had made these towers a true center of world trade—all reduced to dust in one long moment. Ten years later as I stand here in this beautiful and holy place as a bishop, not as a frightened, distraught “assistant” kneeling by a burning pile, I am reminded that one of the models for me of what a bishop should be, is Augustine of Hippo. Augustine of Hippo was a bishop who served in North Africa, in what is today Algeria, a millennium and a half ago. He turned more than once to Psalm 30 to give hope to congregations faced with the destruction of the Roman Empire, which was being struck repeatedly by violent invasions of Goths and Visigoths. Where was God, the Christians of North Africa asked their bishop, not ten years, ago but 1,500 years ago. Where Was God they asked when the Roman world into which Jesus himself had been born was collapsing all around them. Augustine grasped a handful of dust and lifted it before the eyes of his people, just as I am lifting before you right now this piece of the Twin Towers. This dust has been a symbol of death. “Dust you are and to dust you shall return,” we hear when we are smeared with ashes on the first day of Lent. Yet Augustine proclaimed with mounting emotion, because God has raised Jesus from the dead, the dust of the descendants of Adam will live again. Christ’s resurrection brings hope out of the depths of the most radical terror and seeming failure. “Will the dust praise you?” to Augustine meant that faith in the resurrection allows the People of God to take a heroic stand on the side of the future even when all seems lost and over and finished forever. Augustine preached that God gives us the choice to look down into the pit of despair or up into the heavens with praise. How can we possibly praise God when we grieve; when we are weary; when we tremble? We can do this because Jesus Christ is our companion in this way, and he has gone exactly there first and triumphed, and so shall we. For ten years, I have been inspired by what another preacher, Mother Barbara Crafton said, after she saw the towers fall. She talked about this faith, this simple faith that at this hour still propels us forward as we worry about the growth of this diocese, this stalled economy, our family’s future—this simple faith that makes people take a risk on this venture we inaugurate today. “…a crude drawing of the Twin Towers, with smoke and debris coming up in a cloud from them. On the top of the cloud are all these little figures. They’re dead. And above all this—is Jesus with his arms open in a wide embrace. It is very crude. Hopelessly sentimental. But actually, it’s the truth! Boom! Right to Heaven they went. Immediate. I think that people, because they need to, are grasping at the openness of God’s love, a childish hope of Heaven. My hope of heaven is very childish. It doesn’t differ materially from that crude drawing. For us, death looks like the end. But I think that, when so many people have died all at once, we are forced to ask ourselves, ‘Well, is it really the end?’ Or is it a moment along a continuum, a widening of a life that actually goes on. And so, they are more present with us now than they were when they were here. So you dream of them. You hear their song. You see someone who walks like them. A million things bring them back, never, at least in the early years, without a dagger through your heart, but also never increasingly without gratitude that you had them at all, and without the suspicion that they are with us in some way. And to me, more and more the older I get, the closer I get to going over there myself, the more evidence, satisfying only to me, I’ll admit, but evidence I see that life goes on. Not this life—and we might wish it were—but life, nonetheless. I believe it more and more. • Worship and preaching, and music where people are transformed and community is built through people encountering God and Jesus Christ and the hope of the Resurrection. • Parallel development, where within the context of protecting our tradition, as you protect this traditional building, new forms of liturgy and music, and worship times are tried out. I want you to lead the way, and I want to thank each and every one of you for crafting this model for us. 9/11 – a day to celebrate new ministry. Could that be? Well, I think it is a perfect day. Because where we choose to stand on 9/11, where we stand at Ground Zero, or where we stand on Linwood Avenue at North Street in Buffalo will make the difference of whether we look down into the pit of despair or into the heavens with praise. Where we choose to stand will allow us to be transformed either by idealism or cynicism. This afternoon we stand inside the walls of the Church of the Ascension to watch this new plan take shape; the dust of death transformed by your hands and the power of the Holy Spirit, into new life. In the name of that Spirit, and the redeemer, and the creator, Amen. Thank you for your confidence in what we’re trying to do, Bishop. And thank you for your inspiring words and never-ending support for the web of grace being spun right here in Western New York!! !